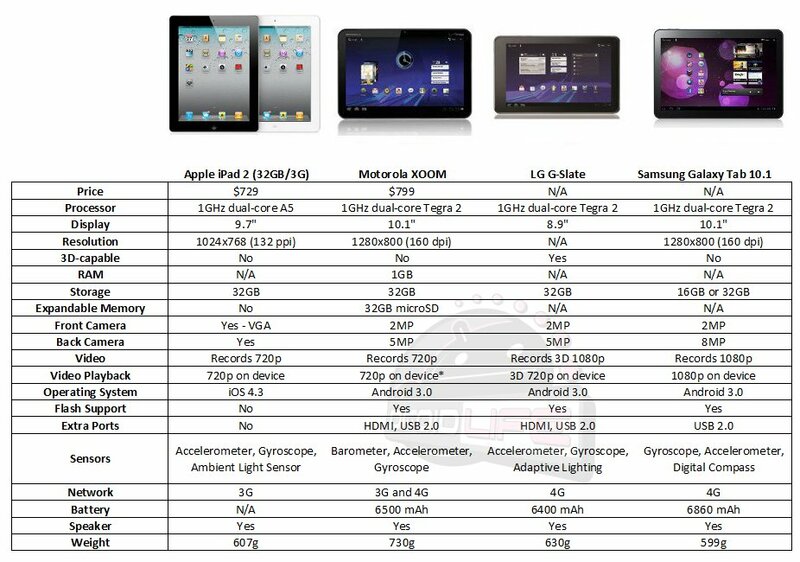 After comparing the original iPad to the Motorola XOOM a few weeks back, we took a lot of heat on how “unfair” it was to do that to a product that was almost a year old. The Apple enthusiasts came in waves and the cries for “Just wait for the iPad2!” rang out through the night. Well peeps, here is your comparison to the newly announced iPad 2…nothing groundbreaking at all here. Straight from their spec sheets. Cheaper price and a thinner body. That’s it. We’ve already seen dual-cameras, dual-core processors and HD recording. What we aren’t seeing on this new product though, is 1080p on-device playback, Flash support (hah! ), 4G capabilities, or expandable storage. And what’s up with that giant bezel? *Note* – HD playback on the XOOM is now questionable. Motodev site lists it as “Max” 1080p, but the regular consumer XOOM page says just 720p.